November 7, 1922 at Laxmi Bazar Shah Shaheb Bari (the house of the spiritual leader of Laxmi Bazar), a well known hub of spritual practice, which was his maternal grandfather’s home in Dhaka, Bangladesh. His maternal grandfather Shah Sayed Abdul Monaem was the Shah Shaheb (spiritual leader) at that time. His ancestoral home is Maulvi Bari (house of religious scholars), Birgaon village, Nabinagor sub district, district of Brahminbaria, some 80 miles South/South East of the capital Dhaka. For 5 generations before him, his family have been resident of Brahminbaria district and were well known as a family of religious scholars. His great grandfather, Munshi Shahabuddin, was known as the most prominent religious scholar on the east of the Meghna River. His first known ancestor was Shaikh Zaki, the great grandfather of his great grandfather, who is known to have migrated there from the Middle East. Although his actual family name is Shaikh, his great grandfather Munshi Shabuddin dropped it from their name and it has never been used since then. His maternal family has been known as a family of spiritual and religious scholars for generations. His maternal family home is still well respected by the locals for spiritual and religious guidance. Junior school : Junior New Scheme Madrasha, Barail and Hucha Miah High Madrasha, Comilla. Passed High Madrasha Exam (Equivalent to S.S.C.) in 1937 and achieved 13th position in merit list. Passed H.S.C. from the same College in 1944 achieving 10th position. University : Passed BA with Arabic, English and Political Science in 1946 from Dhaka University. Passed MA in Political Science in 1948 from Dhaka University. 1944 – 1946 : Assistant Secretary, Purbo-Pakistan Shahitto Shangsod (East Pasistan Literary Society). 1946 – 1947 : General Secretary, Hall Union, Fazlul Haq Muslim Hall, Dhaka University. 1947 – 1948 : General Secretary, Dhaka University Central Student’s Union (DUCSU). He reportedly received the highest votes amongst all the candidates. 1948 : As the DUCSU General Secretary, Ghulam Azam presented the Historic Memorandum demanding Bengali to be a state language, to Mr. Liakat Ali Khan, the then Prime Minister of Pakistan, on Nov 27, 1948 at the Dhaka University Gymnasium ground, on behalf of all the students. Mid 1930s: Spoke at a rally as a school boy, organised in support of Palestine. He was also a keen sportsman and was a very good volleyball and badminton player. Also a good singer, he won the college competition for Naat-E-Rasul (songs to praise the prophet). 1950 – 1955 :Lecturer, and later Professor, Dept. of Political Science, Rangpur Carmichael College (now a university). This was his only employment before committing his life in full time politics and dedicating his entire life for the service of the people. 1952 – 1954 : Founder Secretary, Tamuddon Mojlish, Rangpur District . 1951 – 1954 : Ameer, Tabligh Jamayat, Rangpur, a worldwide religious organisation. 1958 : President, Editorial Board, The Daily Ittehad, Dhaka. 1954 : Formally joined Jamaat-e-Islami, the leading Islamic political party in the country. Soon became the Founder President of the party’s unit at Rangpur Carmichael College. 1955 : Became full member of the party while in jail. Upon his release from jail, gave up his job as a Professor to engage with the party full time. 1978 – 2001 : Ameer (President), Bangladesh Jamaat-E-Islami. 1948 : DUCSU General Secretary Ghulam Azam was arrested on March 11, 1948 for his role in the famous Language Movement. 1952 : Pakistan Government arrested him for his continued involvement in the Language Movement in Rangpur. 1955 : Pakistan Government arrested him again for activities in the Language Movement. 1964 : Following the banning of Jamaat-e-Islami by Pakistan government, he was arrested while attending party’s Central Committee meeting in the then West Pakistan. He was released after 6 months. When he flew back to Dhaka, he was at Dhaka Airport upon got released through court after 2 months. 1992 : He was arrested by Bangladesh Government for becoming the leader of a Bangladeshi political party without the nationality of Bangladesh (which was wrongfully taken away by Sheikh Mujibur Rahman in 1973), following the public announcement of his election as the Ameer (President) of Bangladesh Jamaat-e-Islami, after decades being the Ameer behind the scene.This was followed by a court case by his family to challenge the government, demanding the restoration of his nationality as his birth right. In 1994, the High Court ruled that there is no evidence to accuse or implicate him for any crimes during 1971 war, the key reason used to strip him of his nationality by the then Awami League led govt. The High Court also ordered the government to immediately restore his nationality and release him from prison. He was released, with full honour and right, after 16 months. 1954 General Election: At an election rally in Rangpur in 1954, organised by Jukto Front (Combined Front), the main opposition political alliance, Prof. Ghulam Azam was introduced to Hussain Shaheed Suhrawardy, the Leader of Jukto Front (who later became the Prime Minsiter, following the victory of Jukto Front in the election). The introducer was none other than Sheikh Mujibur Rahman, a friend of Prof. Azam during their student days, who later became the President of Awami League, the Father of the Nation, the Prime Minister and President of Bangladesh, and the man behind the independence of Bangladesh. Member of Central Committee, Democtratic Action Committee (DAC), a combined opposition alliance formed against General Ayub Khan, the then President of Pakistan,during late 60s. Participated in the Round Table Conference (RTC) held by the then President of Pakistan, General Ayub Khan in late 60s, with representatives of all political parties of the country. He represented Jamaat-e-Islami East Pakistan. Secretary General, Pakistan Democratic Movement (PDM), a combined opposition alliance against Pakistani ruler. During the mid 80s, under General Ershad’s Martial Law, he floated the idea of a non-party Caretaker Govt to conduct the National Parliamentary Elections. 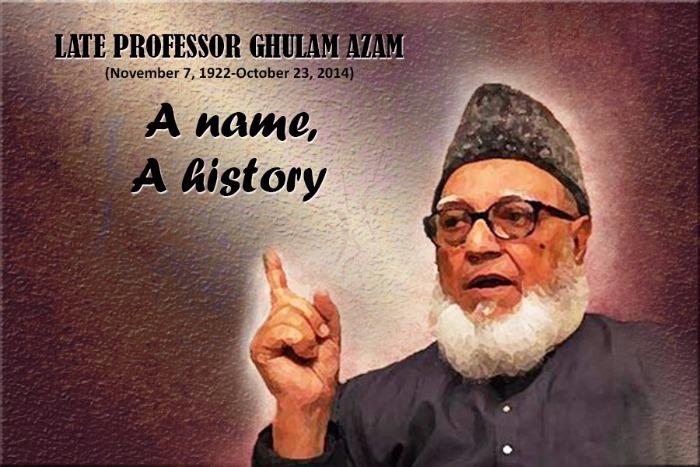 Professor Ghulam Azam is not only a politician and Islamic thinker but also a prominent writer. He has authored 138 books, mainly in his native language, but some in English as well. These books are mainly on Islam and Bangladesh. He also authored a 9 volume series of his memoir titled ‘’Jibone Ja Dekhlam” (Reflections of My life). He is a prolific writer. The style of his writing is simple and lucid, useful to all classes of readers. NOTE: For more details, read his memoire or see his interview with Dhaka Digest.